Periscope is the hottest new social media channel and everyone is talking about it. This is what the Periscope team say on their website. Periscope is an app (currently only iOS, but Android is coming soon) that allows you create and share live video broadcasts. You can also watch other users’ broadcasts and interact with them in real time by sending messages. You can watch and experience events that are happening across the globe. You could be watching anything from the recent riots in Baltimore to a cat sleeping in Bristol, whatever interests you! Follow our short tutorial below to start using Periscope. You first need to download the app from iTunes and whilst Periscope is a stand-alone app it does integrate with Twitter and you will need to log in with your Twitter details. Periscope will invite you to follow featured users and people you may already follow on Twitter. You can choose to enable notifications so you won’t miss the broadcasts of the people you follow. The first tab shows which of the people you are following are currently live, it will also show recent broadcasts for these people. The second tab shows a list of featured and live broadcasts from around the globe. Tap the Broadcast (third) tab on the menu bar to start broadcasting. First of all you will have the opportunity to describe what you are seeing or about to broadcast. You can choose your location, whether to make your broadcast private, choose who can chat with you or choose whether to post the broadcast to your Twitter feed. Once you’ve selected these options tap ‘Start Broadcast’ to begin broadcasting your live video stream. Your screen will display whatever you are broadcasting. Use the camera icon in the top corner or double tap on the screen to flip the camera. 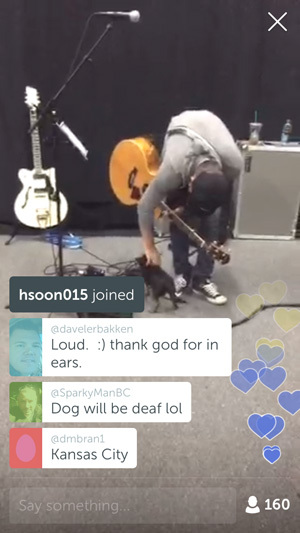 Tap the person icon in the bottom corner to access chat and interact with live viewers. When you have finished your broadcast swipe down and tap ‘Stop Broadcast’. You’ll then be able to instant replay, delete the replay, or save it to your camera roll. If you want to save your broadcasts to your camera roll you can do this through your Periscope settings. Choose a live video broadcast to watch. If you want to send the broadcaster a message tap the ‘Say Something’ box at the bottom and type your message. If you are enjoying the broadcast you can show your appreciation by double tapping the screen to send love hearts. Why is everyone talking about Periscope? 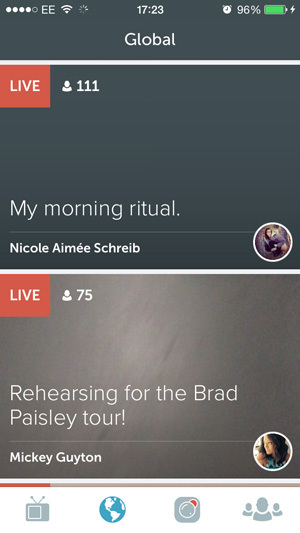 Periscope could be described as the super charged version of Twitter. The attraction of Twitter is the real time access to news, breaking events, trends, photo’s and videos from the people on the ground. Periscope is all that but you are watching the action as it happens and you can interact with those people and ask questions. And it works both ways, you are reaching an audience when you broadcast, you are giving your customers the opportunity to talk to you and ask questions in real time, you are opening the doors to your business. We could continue but we’d love to hear how you think Periscope could be used to promote your business? Get in touch; tell us what you think or if you’d like to know more about how we can help you implement Periscope or any other social media channels into your business give us a call or drop us an email.